It’s Back – The Stuffing Everyone Loves! 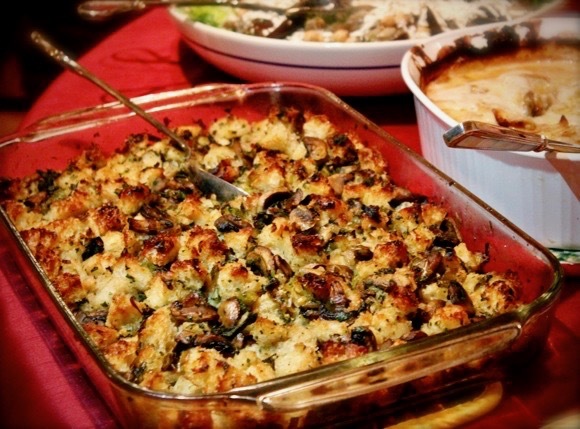 It’s been 5 years since I’ve shared The Stuffing Everyone Loves recipe. So for 2016, it’s back! 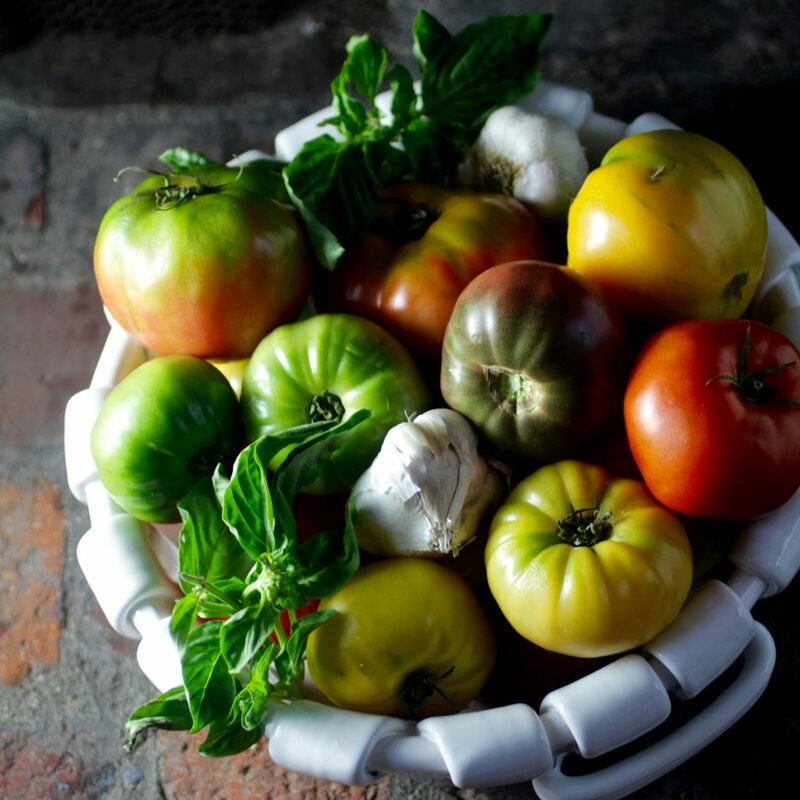 What makes this recipe different from the familiar mushroom sage dressing served on dinner tables all over the country at this time of year? Not much, and that is the beauty of it. It’s just like you remember, only better. And everyone loves it. Rustic ciabatta, with its porous, chewy texture is the perfect bread for this stuffing. A homemade rich-flavored giblet stock, eliminates the need to cook the stuffing inside the turkey, while retaining that classic turkey flavor. A 50-50 ratio of vegetables (mushroom, celery, onion, and leek) to the volume of ciabatta creates a balanced, not overly bready-y dish. Cooking the stuffing in a shallow baking dish allows for the desirable contrast of buttery toasty bread atop a moist stuffing beneath. Plenty of butter, Italian parsley and butter-fried sage bring the classic flavors of the season. And with no “surprise” ingredients (oysters, nuts, fruit, chestnuts) it simply appeals to everyone…and exceeds expectations. Author Lori LynnPosted on November 18, 2016 November 26, 2017 Categories Stylish Entertaining, Tasty RecipesTags food network, stuffing, thanksgiving side dish11 Comments on It’s Back – The Stuffing Everyone Loves! Last Thanksgiving’s Brussels Sprouts with Bacon Shards was such a hit, I’m going to add meat to the veggie dish again this year. 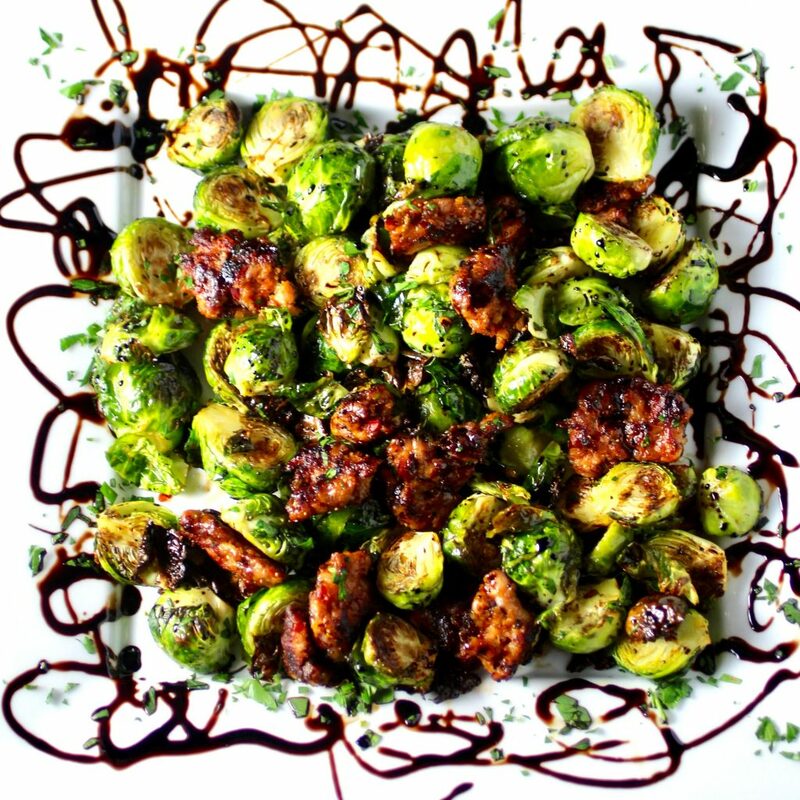 Bacon and Brussels sprouts are a classic pairing, but for an unexpected twist, I’ll be serving the little brassicas with Italian sausage seasoned with fennel. Fennel seeds add interesting anise notes that complement and add complexity to the roasted sprouts. A balsamic vinegar reduction will add sweet notes and enough acid to balance the rich sausage. A sprinkling of parsley will bring bright, fresh qualities. I’m confident that this side dish will be equally, if not more popular, than the bacon version. As a bonus, ease of preparation and a short ingredient list make this one a winner for the busy holiday cook (me). 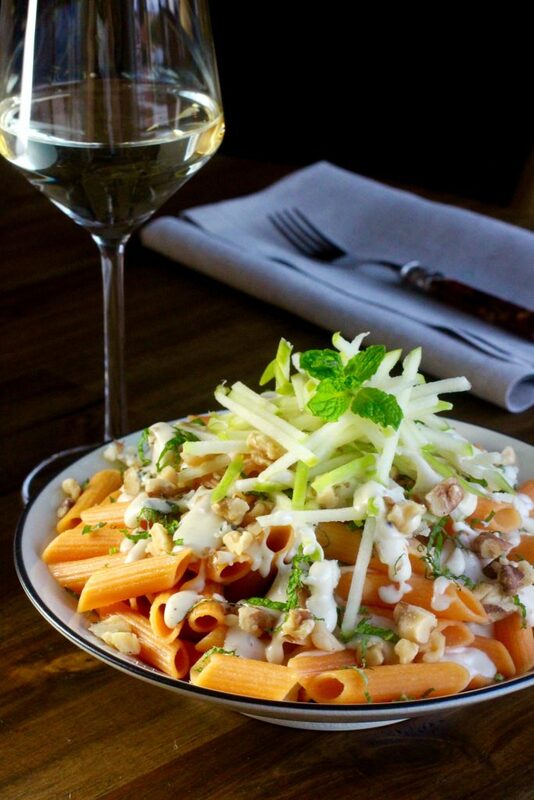 Gorgonzola, Granny Smith apples, and toasted walnuts have a particular affinity for each other. Here they are paired with gluten-free penne for a satisfying wholesome meal with higher protein, higher fiber, and lower net carbs. Explore Cuisine penne is made in Italy and comprised of only two ingredients: organic red lentil flour (73%) and organic brown rice flour (27%). Cool mint adds a note of freshness and counterbalance to the rich gorgonzola sauce while apple cut into allumette shape makes for a jaunty presentation. 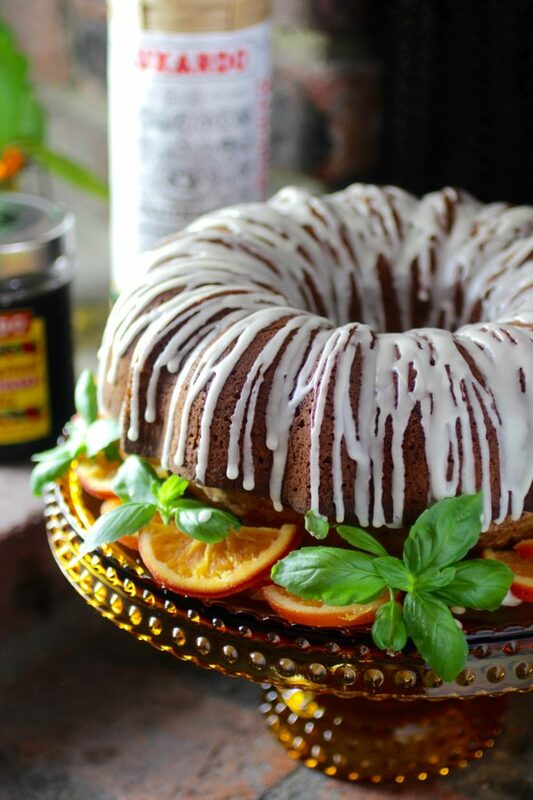 Inspired by last week’s Evolving Manhattan Cocktail with Luxardo Ice Sphere, here Maraschino Liqueur shows up as a glaze for a not-too-sweet bundt cake featuring fruity extra-virgin olive oil. Luxardo Maraschino, a liqueur distilled from the leaves, pits, stems and skins of sour marasca cherries has an almond-like, subtly bitter complex cherry flavor. 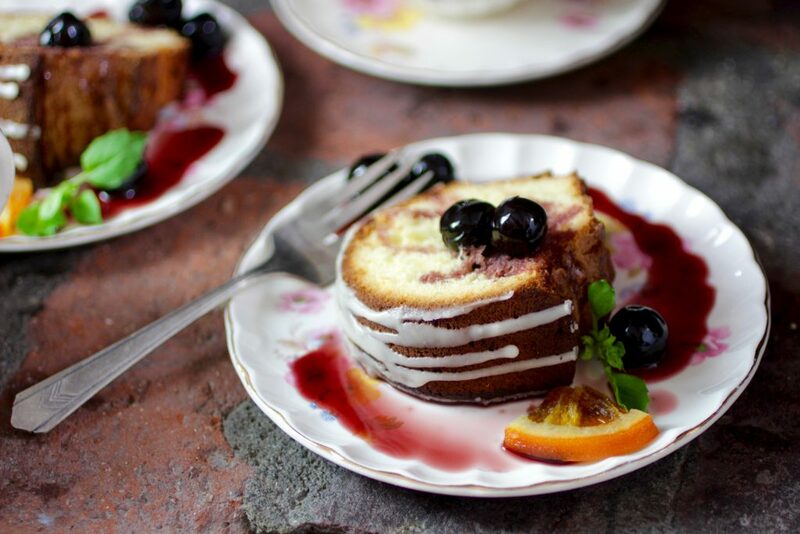 Nicely browned on the outside, with a soft moist interior, the simple yet impressive cake is enhanced with candied orange and those luxurious luxardo cherries and their heavenly juice. And a complementary basil garnish is much more interesting than the ubiquitous mint sprig. 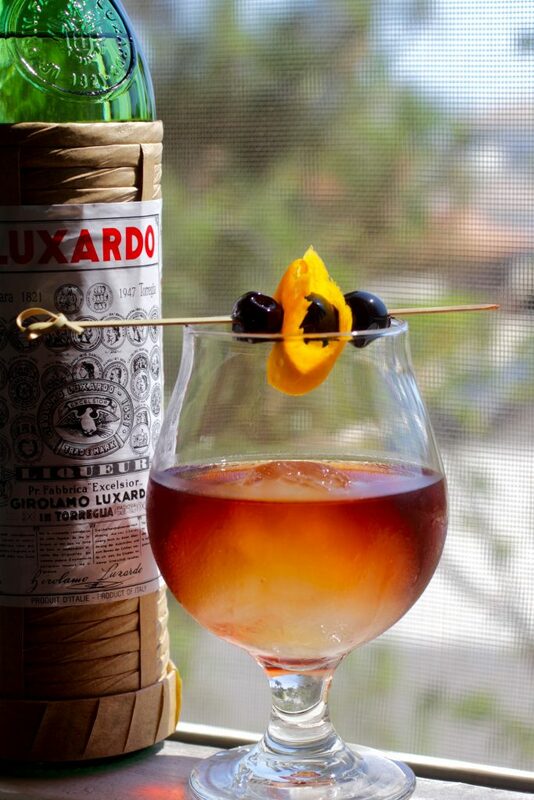 As time passes and the Luxardo ice sphere melts slowly into the Manhattan cocktail, the original drink morphs into another, namely the Brooklyn. One of the five drinks named for the New York City boroughs, the Brooklyn is much lesser known than its neighbor from across the East River, the Manhattan. The distinguishing ingredient in the Brooklyn is Luxardo Maraschino, a liqueur distilled from the leaves, pits, stems and skins of sour marasca cherries. It is not overly sweet with an almond-like, subtly bitter complex cherry flavor. 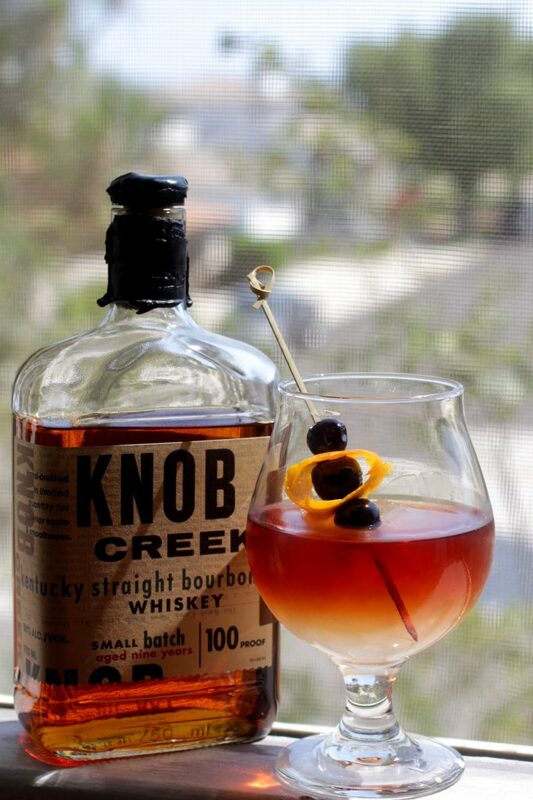 The first sips of this Knob Creek Manhattan are delightfully fierce and quite boozy with rich, woody, caramel Kentucky bourbon flavors only slightly tempered by the fruit and spice attributes of French red vermouth. The Maurin Rouge tastes of ripe cherries and raisins with spice notes of cinnamon, cardamom and clove. A couple dashes of Trinidad’s Angostura Bitters, add a distinctive herbal flavor and a layer of complexity. When sipped slowly, over time another cocktail all together will unfold. One that is less intense, as the ice has melted, flooding the bourbon with the distinct flavor of Luxardo Maraschino and a hint of orange bitters. The Manhattan has mellowed while the characteristics of the Brooklyn have emerged. Now is the time to nibble on those authentic luxurious Italian cherries. Dark, dense, chewy, and sweet-tart, they’re surprisingly worth the $20 for an 8 oz. jar. In an ephemeral memory, I remember her disappointment when being served a Greek salad long ago at some swanky Chicago restaurant. It had all the requisite ingredients, but was composed with lettuce. 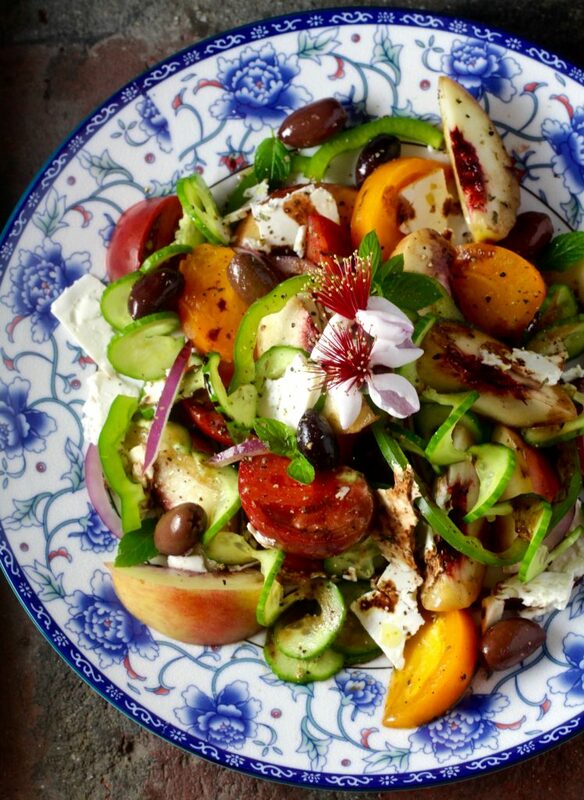 Lettuce, she told us, was not supposed to be in a Greek salad. With absolutely no Greek ancestry whatsoever, my wonderful mother was an ardent fan of Greek food. When she would return to Chicago to visit family and friends, dinner out with my Aunt Alice for Athenian chicken was on the top of her list. And for more interest, exchange the recipe’s predictable pinch of red chili flakes with Korean chili threads, shilgochu 실고추, finely-sliced dried chilis that are reddish brown in color with smoky red pepper and fruity flavors, and a medium degree of heat. 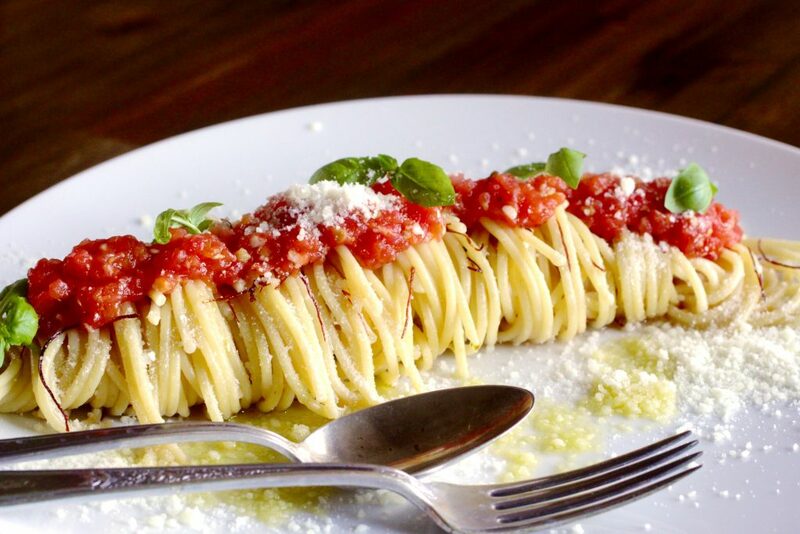 They are cooked in butter for about a minute to soften then tossed with the spaghetti, adding a vibrant accent to the dish.